I finished Janathon with three miles. It brings me to a total of 81 miles of running in the month. I was delighted to see abradypus and iliketocount crash through the 200 mile barrier, and am still awestruck by silvermetalfox's achievement of 502 miles in the month. We've had all sorts of weather, warm, cold, wet, snowy, windy and, this being Seaford, even more windy. Do I regret doing it? Of course not.. I almost look forward to Juneathon, for it's a day shorter than the winter activity. Mrs R has spoken of her relief that it is over, though I'm not sure she realises that it will be replaced by a step-up in marathon training. I am sorry not to be able to join the post-Janathon drinks and meal in London on Saturday, and meet once more the doyenne of Janathon, JogBlog. Instead, I offer three cheers to her, and all Janathoners everywhere. Hip! Ray! Hip! Ray! Hip! Ray! I took today as leave, not least so I could enjoy a speed session in daylight. It consisted of three one mile legs, with a mile warm-up and cool-down at either end, and quarter of a mile recoveries. I rather like speed training, but the weather has conspired against me so far; last week the pavements were far too icy to try anything fast. Indeed, today was more than a little windy, and the waves were big enough to satisfy any surfer apart from Garret McNamara. So my third leg, when I had turned and had the wind behind me, was run at 9:43 pace, while the first two were 10:02 and 10:09 respectively. Usually, in spite of my efforts to run each leg at the same pace, I slow down towards the end. There's extraordinary things happening at the top of the Janathon table. Silvermetalfox is on 490 miles, I'm sure intending to crack 500 by close of play tomorrow. And I am proud to say that I have met and once marshalled for abradypus, who lies fifth with 219. Up early and out into wind and rain for four and a bit miles. It wasn't cold, but hard work in the wind and I see from my average speed that though I was on road, I was slow. Do people fall for these e-mails, and open up their blogs to complete strangers to flog their pox-ridden businesses? I suppose a few must. Did I mention I won a medal? Here's more proof. I swam this evening, 600 metres, and pushed myself to go faster. It's very easy to slip into a leisurely pace, forgivable in a river on a hot summer's day but not in a pool in January when there's hard Janathoning to be done. By the end I had the pool to myself. I'm not sure what that says about my swimming style. Seven miles today, and whenever I have to do seven miles, the fact that it is more or less exactly seven miles from home to the end of the east pier at Newhaven harbour and back impels me to choose that route. It was worth it: high seas, a stiff wind going, but behind me on the way back. There was an odd moment: just after turning at the end of the pier and heading back, I had an episode of vertigo. I am prone to vertigo, and it was that same feeling of panic that I remember from taking my daughter and her friends on the London Eye for a birthday treat many years ago. Why this should occur on a firmly constructed, not very high pier I cannot explain. I am used to the sea, and if I'm on the water in a dinghy or RIB, am perfectly fine. I ran back to terra firma as quickly as I could. It was warm and I went out in shorts, t-shirt and top, and took the top off during the return leg. 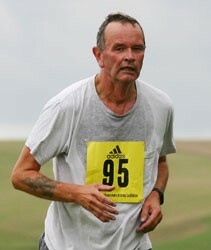 At last night's Seaford Striders awards evening, I came third in my age group, Super Vet Men (50-59). I think faithful readers who have read my entries throughout Janathon deserve a look at my medal, don't you? Tonight is the Seaford Striders awards night. Out in the evening for a quick run, two miles by the seaside. I had to be back quickly to meet a fellow Strider to talk about the Juniors page on the website. During the day at work, I came upon a NICE briefing for local authorities on how to encourage people to walk and cycle more regularly. I was very alarmed to read some of the statistics about levels of exercise in the population. For example, 'only 6% of men and 4% of women achieved at least 30 minutes of moderate or vigorous activity on at least 5 days'. I wonder what running clubs can do to help change this, and whether local authorities see us as organisations that can help. I shall say nothing more about yesterday and would appreciate it if you would do the same. Today, by contrast, I had a decent four mile run in the evening. It was cold but the ground underfoot seemed safe. The worst thing that happened to me was a wet foot from stepping in a puddle. Towards the end my left ankle was painful, but did nothing to stop me. The weather is supposed to improve at the weekend, that is to say become warmer, though no drier. I didn't run today, or anything else. I could plead the excuse of being stuck on the A27 last night. Instead I offer you last night's Night Waves in which Alan Rusbridger and Matthew Taylor discuss running, playing the piano and amateurism. It starts about twenty minutes in.